Kristi Zsitvay '14 blasts a shot on goal during the Jeffs 1-0 win over the Mules. The No. 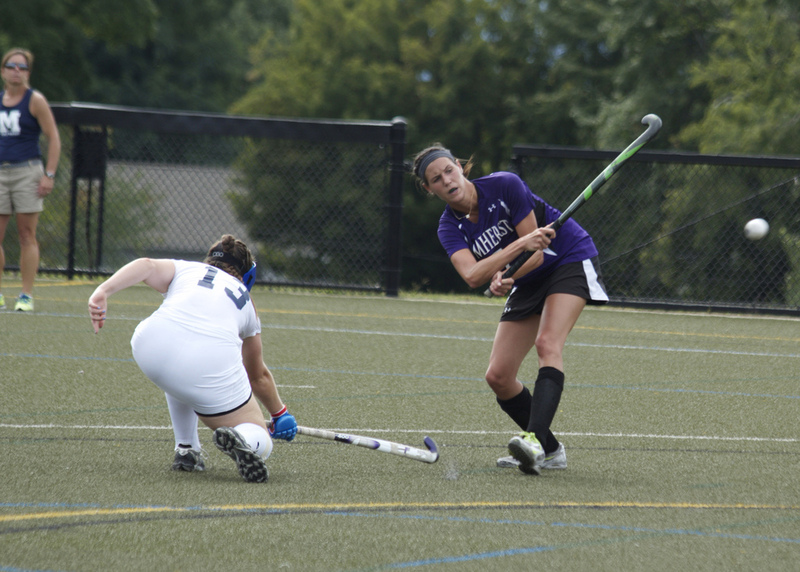 10-ranked Amherst field hockey team travelled to Waterville, Maine on Saturday, Oct. 12 to take on Colby in an important NESCAC battle. The Jeffs extended their winning streak to eight games and improved their overall record to 8-2 and 6-1 in NESCAC play as they defeated the Mules 1-0. Prior to the meeting, Colby had not surrendered a single goal on their home turf all season. Coach Carol Knerr commented on the team’s knowledge of this statistic and how they were able to overcome it. “Colby is a much improved team and we knew it would be a challenge to go to their home field and get the win,” Kerr said. Forward Sara Culhane ’17 scored the lone goal of the match, which was her seventh of the season. It came with just under five minutes remaining in the first half, as she corralled the rebound off a hard shot by Kristi Zsitvay ’14 that the Colby goalkeeper could not swallow up. Culhane leads all first-year players for the Jeffs with seven goals, while she is third overall on the squad in goals scored, behind sophomore forward Katie Paolano (nine goals) and junior forward Madeline Tank (eight goals). Zsitvay, Tank, and midfielder Alex Philie ’14 each had five attempts on goal for the Jeffs, leading them to a 19-7 advantage over Colby. Amherst dominated in penalty corners, taking 11 to Colby’s three. First-year Emily Horwitz made her first start in net and earned the shutout, turning away four Colby shots. Knerr also noted Horwitz’s outstanding play in her first start. “Our first-year goalie did a great job stepping up and fulfilling a new role in a late season, important game,” Kerr said. The Jeffs remain tied for the top spot in the NESCAC with an 8-2 overall record. They will play host to the Cardinals of Wesleyan (4-5) for the Homecoming match on Saturday, Oct. 19 at noon.